The book describes the migration experiences gained while migrating a Siebel 2000 database at the IBM ITSO Poughkeepsie Center in New York, and at the IBM Hursley Laboratory in the UK. 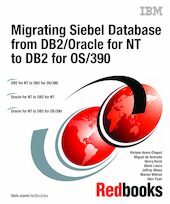 It provides an overview of Siebel architecture, and introduces the migration methodology needed to move the Siebel database from a DB2/Oracle for NT platform to a DB2 for OS/390 platform. It offers a step-by-step description of the database migration process, and discusses in detail the different methods of moving data from one platform to the other. This book will be especially useful for those migrating the Siebel database for the first time.